#1. This week's number one is an international power forward Evariste Shonganya (204-92, currently plays in Sweden). He led KFUM Jamtland to a 3-point victory against the closely-ranked Boras Basket (3-1) 93-90 in the Swedish Basketligan in Tuesday night's game. Shonganya had a double-double by scoring 16 points and getting 14 rebounds. He also added 4 assists and 2 blocks in 31 minutes on the court. It was the game of the round between two top 4 ranked teams. KFUM Jamtland Basket (3-1) is placed first in the Basketligan. It was his team's third consecutive victory in a row. But this is still an early stage of the season and everything may happen. It's Shonganya's first year with the team. Shonganya has individually a very good season with high stats. He averages: 19.0ppg, 14.8rpg, 4.3apg, 1.5bpg, 1.8spg, 2FGP: 55.1%(27-49) and FT: 57.6% in four games he played so far. Shonganya is currently a member of the DR Congolese senior national team. #2. Second place goes to an international small forward Christian Eyenga (201-89, currently plays in Spain). He could not help Baloncesto Fuenlabrada (1-2) to beat Movil Estudiantes (1-0). Eyenga scored 6 points in 19 minutes. It was his first game for Baloncesto Fuenlabrada this season. Baloncesto Fuenlabrada was edged 77-75 in a derby game by the much higher-ranked (#3) Movil Estudiantes. Eyenga is in the roster of the DR Congolese senior national team. #3. The DR Congolese player who performed third best last week abroad was an international guard Mathieu Kamba (196, agency: Dynamics Global Management, college: Cent.Arkansas, currently plays in Spain). He was not able to help Araberri (0-1) in their last game on Saturday. Despite Kamba's very good performance Araberri was edged 111-109 at home by the higher-ranked Melilla_Baloncesto (#7). He recorded 15 points, 4 rebounds, 3 assists and 3 steals. It was his first game for Araberri this season. Kamba has a dual citizenship: Canadian and DR Congolese. He is also a member of the DR Congolese senior national team. #4. Swingman Shekinah Munanga (201-97, currently plays in France) contributed to a Etoile Angers' victory against the 13th-ranked Rueil (1-3) 91-80 in the French NM1 (third division) last Friday. Munanga recorded 6 points and grabbed 8 rebounds. Etoile Angers Basketis placed first in Group B. It's Munanga's first season with the team. His overall stats this year are: 3.0ppg and 4.3rpg. Munanga is also DR Congolese national team player. #5. International center Gullit Mukendi (203-96, currently plays in Spain) helped Azuqueca win their game against the 11th-ranked Moron (0-1) 79-63 in the Spanish LEB Silver (third division) in Saturday night's game. He recorded 7 points. It was his first game for Azuqueca this season. His team is placed third in East group. Mukendi plays currently for the DR Congolese national team. #6. Forward Eric Kibi (198-90, college: Abil.Christian, currently plays in France) was not able to secure a victory for GET Vosges (0-4) in their game against Saint Vallier (2-2) in the French NM1 (third division). He recorded only 4 points, 7 rebounds and 3 assists in 30 minutes. The 14th-placed GET Vosges (0-4) lost 68-82 on the road to the much higher-ranked (#7) Saint Vallier in the Group A. So far GET Vosges lost all four games in the Regular Season. This year Kibi's overall stats are: 6.3ppg, 5.3rpg, 2.8apg and 1.5spg in four games. He is international player as he played for the DR Congolese senior team one years ago. #1. Cedric Kuakumensah (204-F-93, college: Brown, currently plays in France) led Souffelweyersheim to a victory over the ninth-ranked Feurs EF (2-2) 71-56 in the French NM1 (third division) last Saturday. He was MVP of the game. Kuakumensah recorded 19 points, 9 rebounds and 3 assists; quite an impressive performance considering it's only his third season in pro basketball. BC Souffelweyersheim (4-0) is placed third in Group A. So far his team won all four games in the Regular Season. But the season just started, so everything may happen. It's Kuakumensah's first year with the team. Kuakumensah has relatively good stats this season: 13.3ppg, 7.3rpg and 1.8apg. He is a naturalized American. Strangely Kuakumensah has never played in DR Congo. #2. Charles Kahudi (199-SF-86, currently plays in France) contributed to an easy victory against the league outsider Provence Basket (0-4) crushing them 88-64 in the French ProA on Saturday night. He recorded 14 points, 6 rebounds and 4 assists in 24 minutes. ASVEL Lyon-Villeurbanne Basket (4-0) is placed first in the ProA. So far his team won all four games in the Regular Season. But the season is still in it's first stage and everything can happen. 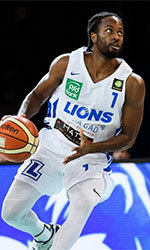 Kahudi is one of the most experienced players in a team as it's his fourth year in ASVEL Lyon-Villeurbanne Basket's roster. Kahudi has relatively good stats this season: 11.8ppg, 4.0rpg and 2.3apg in four games he played so far. He has a dual citizenship: DR Congolese and French. #3. Experienced Wen Boss Mukubu (198-F-83, college: UAB, currently plays in Belgium) managed to help Hubo Limburg United to win against the eighth-ranked Okapi Aalstar (0-2) 97-78 in the Belgian Euromillions League in Friday night's game. Mukubu scored only 3 points and grabbed 4 rebounds. It was his first game for Limburg United this season. His team is placed fourth in the Euromillions League. But there are still lots of games to play and it's a long way to go. Mukubu is another player who holds two passports: DR Congolese and Belgian. #4. Junior Etou (203-F-94, college: Tulsa, currently plays in Turkey). He could not help Sakarya BSB (0-1) to beat Turk Telekom (1-0). Etou recorded 8 points and grabbed 8 rebounds in 24 minutes. It was his first game for Sakarya BSB this season. The bottom-ranked Sakarya BSB lost 55-65 at home to the much higher-ranked (#7) Turk Telekom. #5. Moses Ehambe (198-G/F-86, agency: Octagon Europe, college: ORU, currently plays in France) was not able to help Le Portel in their game against Le Mans (2-2) in the French ProA. Ehambe did not beat the league record on Saturday evening. He recorded only 2 points. Le Portel was badly defeated 102-82 on the road by the lower-ranked Le Mans (#10). It's Ehambe's first season with the team. Ehambe's overall stats this year are: 9.5ppg and 2.3rpg. He is a naturalized American. Strangely Ehambe has never played in DR Congo. #6. Panagiotis Mayindombe (191-G-88, currently plays in United Kingdom) contributed to a 3-point Bristol Acadamy Flyers' victory against the ninth-ranked Worcester Wolves 80-77 in the British BBL on Friday night. Mayindombe scored 5 points and had 3 steals in 17 minutes. This year Mayindombe's overall stats are: 3.8ppg, 1.5rpg and 2.0apg in four games. He has both DR Congolese and Greek nationalities. #7. Eric Katenda (206-F-92, college: N.Texas, currently plays in Sweden) was not able to secure a victory for Uppsala Basket (0-4) in their last game on Tuesday. Despite Katenda's good performance the bottom-ranked Uppsala Basket was crushed 97-65 in Norrkoping by the second-ranked Dolphins. He recorded a double-double by scoring 14 points and getting 12 rebounds. Katenda also added 2 blocks. Katenda has individually a very good season with high stats. He averages: 16.3ppg, 6.8rpg and 1.5apg. Katenda also holds two passports: DR Congolese and French. #8. Kevin Tumba (206-C/F-91, currently plays in Spain) couldn't help UCAM Murcia in their game against Valencia Basket in the Spanish Liga Endesa. He scored only 4 points in 7 minutes on the court. His team lost 68-81. This year Tumba's overall stats are: 3.5ppg and 1.5rpg in two games. He holds both DR Congolese and Belgian passports. #9. Guy Muya (193-PG-83, currently plays in Belgium) couldn't help Basic-Fit Brussels in their game against Oostende in the Belgian Euromillions League. Muya scored 5 points. It was his first game for Basic-Fit Brussels this season. His team was edged 84-83. Muya has DR Congolese and Belgian nationalities. #10. Brice Massamba (208-F/C-88, college: UNLV, currently plays in Sweden) contributed to an easy victory against the 11th-ranked Uppsala Basket crushing them 90-59 in the Swedish Basketligan in Friday night's game. He scored only 3 points in 7 minutes on the court. This year Massamba's overall stats are: 4.3ppg and 2.3rpg in four games. He has dual citizenship: DR Congolese and Swedish.